It was in the best interests of Timothy Bradley to avoid a war with Brandon Rios and in the best interests of Rios to drag Bradley into one. Bradley succeeded in his mission, engaging in battle at the right times, breaking Rios down and scoring a ninth-round technical knockout. arly in his entertaining first win over Mike Alvarado in 2012. Bradley, meanwhile, took part in a brutal battle with Ruslan Provodnikov in 2013 and then survived being badly wobbled in the final seconds of his bout with Jessie Vargas earlier this year. He came out victorious both times but would’ve preferred to get the wins without getting hurt. So in this fight with Rios, Bradley’s first under trainer Teddy Atlas, he did his best to punch and then move, not giving Rios many chances to set his feet and throw. Bradley also sent shots out from angles instead of remaining in a spot where Rios could catch him. 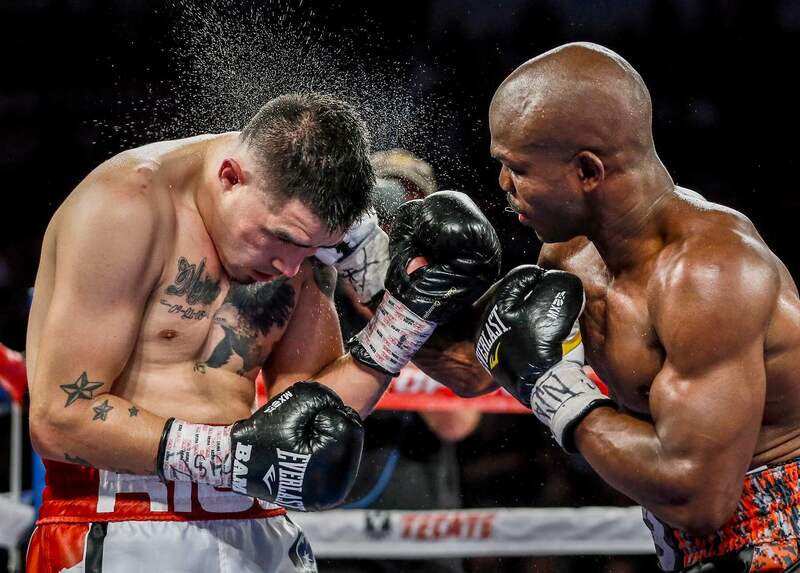 Rios did maneuver Bradley to the ropes at times in the early rounds, but Bradley handled those occasions well and made sure they happened less often as the fight went on. The other important thing Bradley did was target the body of Rios, who had gone from 147 pounds at the weigh-in to a massive 170 pounds by fight night. About one in every three punches Bradley landed was a body shot. He landed 88 in total, including the punches that ended the fight. 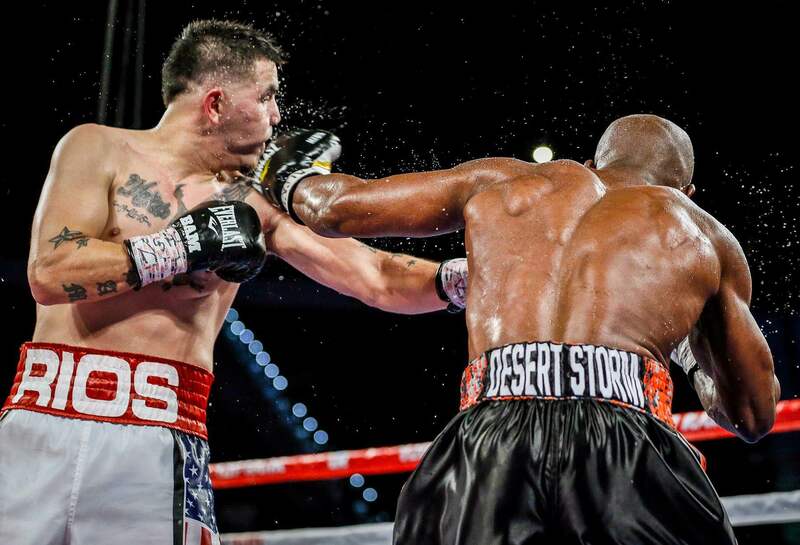 A left hook to the midsection put Rios down in the final minute of the ninth round. Rios rose, only to drop once more as Bradley banged away with a barrage. The referee stepped in and waved things off. Rios announced his retirement afterward, saying his body no longer was responding the way it once did. We’ll see if his retirement sticks or if he’ll come back like so many other boxers do, drawn by the allure of competition or a need for more money. Bradley, a two-division titleholder who won belts at 140 and 147, has only lost once — a unanimous decision loss to Manny Pacquiao in their 2014 rematch. Many believe Bradley also deserved the defeat in his first fight with Pacquiao in 2013 and not the split decision he was awarded instead. He wants a third fight with Pacquiao or even a shot at Canelo Alvarez if Alvarez beats Miguel Cotto later this month, yet we’re more likely to see him defend his title against mandatory challenger Sadam Ali next. Vasyl Lomachenko is considered by some to be one of the best amateur boxers ever. While it’s still too early to say he’s one of the best professional prizefighters of today, Lomachenko’s speed and skills were more than enough to lead him to an easy 10th-round knockout victory over an outgunned Romulo Koasicha. Lomachenko won gold medals in the 2008 and 2012 Olympics and has transitioned well into the paid ranks so far. Koasicha had lost four times before, with his most recent defeat coming in 2014 to Lee Selby, who went on to win a world title at 126 pounds. Lomachenko also has a title at featherweight, and the difference in class between him and his opponent was apparent from the outset. Koasicha rarely could hit Lomachenko and never could hurt him. 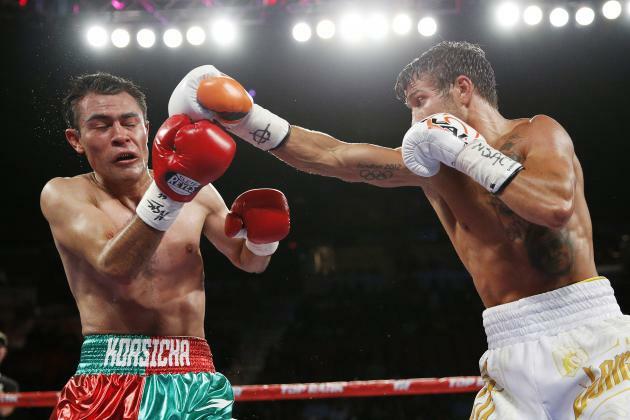 Lomachenko landed often — 334 times in total, more than quadruple the 75 that Koasicha landed. Lomachenko seemed to be toying with Koasicha at times, not putting full force behind his shots but concerning Koasicha nonetheless with how many punches were coming and how fast they were. Lomachenko began mixing in harder punches on occasion later. After the eighth round, Koasicha’s trainer warned him that he was considering stopping the fight. In the 10th, Lomachenko did that job himself. He sent a barrage of shots upstairs and down, hurting Koasicha to the body, following up and making Koasicha take a knee until the referee was done counting. There was no point in continuing. Lomachenko looks great enough that many are high on how far he can go and how well he would fare against the other top fighters at 126. His sole loss — a split decision to Orlando Salido in early 2014 — is seen as excusable given how Salido came in blatantly overweight, used that size to his advantage, got away with a bevy of low blows and still barely won. Lomachenko went on to win a title in his next fight by outpointing Gary Russell Jr., who now has a title belt of his own. Yet a number of potential fights seem unlikely. We probably won’t ever see Lomachenko against Leo Santa Cruz thanks to the business of boxing. Lomachenko’s team wasn’t able to reach an agreement for a fight with Guillermo Rigondeaux, another marvelous two-time Olympic medalist and the best boxer at 122 pounds today. And a bout with Nicholas Walters would’ve been possible had Walters not grown out of the featherweight division. Lomachenko has yet to follow Walters up to 130. Lomachenko has tons of talent. It would be a shame if all of that talent only is shown against opponents who have much, much less than him. Alexander Povetkin’s win over Mariusz Wach didn’t have as explosive an ending as his previous three knockouts, but it was a clear win nonetheless. Povetkin closed the distance on his much taller opponent after a few rounds, began to land more frequently, and ultimately stopped Wach in the 12th round after the ringside physician checked on a cut and swelling underneath of his left eye. The victory was Povetkin’s fourth in a row since his hard-to-watch decision loss to heavyweight champion Wladimir Klitschko in 2013. He remains in position for another big fight in 2016 because he is the mandatory challenger to titleholder Deontay Wilder. Wach, like Wilder, is 6-foot-7. The resemblance starts and ends there. Wach is a sturdy fighter who went the distance in a wide loss to Klitschko in 2012 and took Povetkin’s shots well last week. He does not have anywhere near the speed or power that Wilder has. Then again, Wilder hasn’t faced anyone like Povetkin before. Povetkin, a 2004 Olympic gold medalist, does have his flaws. Those were apparent enough in his fortunate win over Marco Huck in 2012 and in the Klitschko loss. Since then, however, he’s shown the kind of fire and firepower that he’ll need in this last shot at the top, taking out Manuel Charr in seven rounds, Carlos Takam in 10, Mike Perez in just 90 seconds, and now Wach. Wilder, who won Olympic bronze in 2008, is expected to have at least one more fight first — in January against an opponent who has yet been announced.